WAND has many other taxonomies than have been mentioned on this blog to date so I'm going to start posting about some of those taxonomies so they can be easily found here. The first one on the list is the WAND Records Retention Taxonomy. 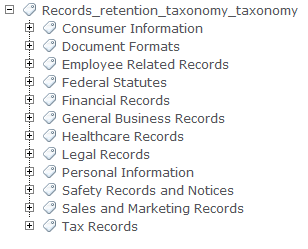 WAND's Records Retention Taxonomy was created by organizing all the common document types that companies must keep as records based on various government requirements. The taxonomy has 370 categories with different types of records with 680 synonyms covering employee records, legal records, general business records, financial records, tax records, safety records, and sales and marketing records. This taxonomy was created by looking at reports regarding United States statutory requirements for record keeping, but many of these record types are important for companies around the world. We did not include retention periods associated with these categories because this can vary depending on which government jurisdiction a company is under. 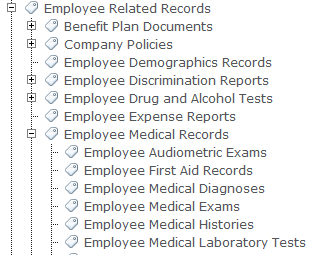 However, this taxonomy puts the infrastructure of document types in place for tagging as meta data or content types and then an organization can apply their own records retention schedule as appropriate. Records retention is a legal necessity for any organization. Get a head start on putting a records retention strategy in place with the WAND Records Retention Taxonomy. As with all of our taxonomies, the WAND Records Retention Taxonomy is available and included with access to the WAND Taxonomy Library Portal, which allows users to browse and download taxonomies throughout the WAND Library for use in your enterprise applications.